Bipasha Basu insists that she's not a pampered celebrity. The picture she posted on twitter though, seemed to go against her claims. 'I need to learn to tie shoe laces asap! Embarassed that I can't! No patience grrrrr! Promise I am not spoilt! Will learn soon,' Bipasha tweeted. She added that the girls in the picture weren't child labourers! 'Well the ppl helping me in the pix r my friend n sister,Who I help often with the same!So am sorry if it hurt anyones sentiments!' she tweeted. 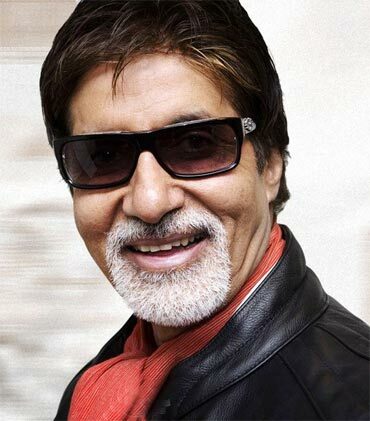 Amitabh Bachchan, who is busy shooting for Prakash Jha's Aakarshan in Bhopal, will be co-starring with Hema Malini yet again. As the Bombay Hight Court upheld the capital punishment for Ajmal Kasab, Bollywood asked for justice too. Director Ken Ghosh suggested a punishment for Kasab. 'kasab punishments they should put him in with the rapists and turn him into a human toilet,' he tweeted. Newlywed Lara Dutta posted a picture of the bridal couple, and thanked her fans. 'A pic for all my twitter friends and followers! Thankyou for all ur wishes! Had the perfiect wedding!' she tweeted. Jiah Khan, meanwhile, thanked everyone for the birthday wishes they sent on her big day on Sunday. 'Thank you all for the birthday wishes! Feel blessed to have all your love and support! Big kiss!' she posted. Stars tweeted about the earthquake in Christchurch, New Zealand, which took place early today, and killed many people. Ameesha Patel, who had also shot there, prayed for the city. 'Feeling real awful bout the earthquake in christchurch..I shot there for kaho naa pyar hai. Such a lovely city n such warm people. God bles' she wrote. Some stars tweeted their best wishes to students appearing for their Higher Secondary (HSC) examinations, which started yesterday. 'Good luck 2 all d students appearin 4der hsc exams 2mrrw, @keegancarneiro my cousin is also 1amongst d students, wish him luck tweeps,' Genelia D'Souza tweeted. Celina Jaitley had a piece of advice for students: 'If yr question paper comes as a complete shock & thr is NOTHING u know , u may "write a list of all good deeds u hav done ths yr" HSC,' she tweeted. Ameesha Patel told students to 'Rock the exams'.